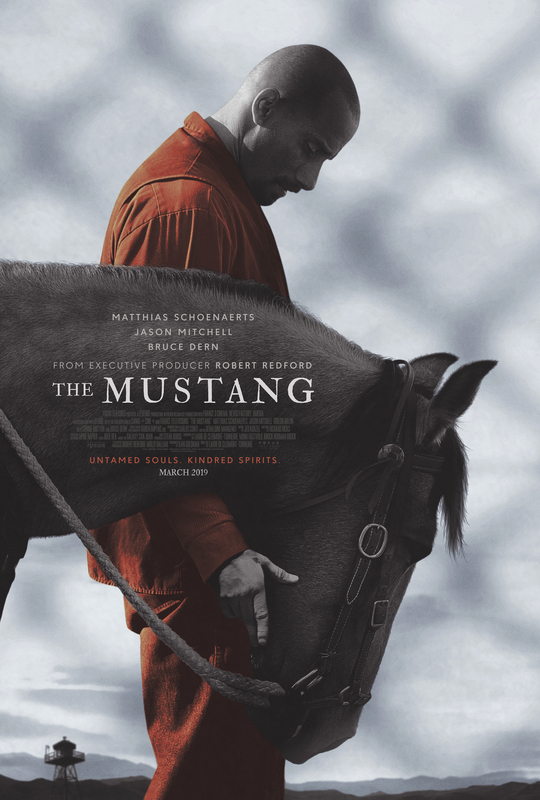 The Mustang touches upon a subject that often gets glossed over in fiction: the attempted rehabilitation of a prisoner. 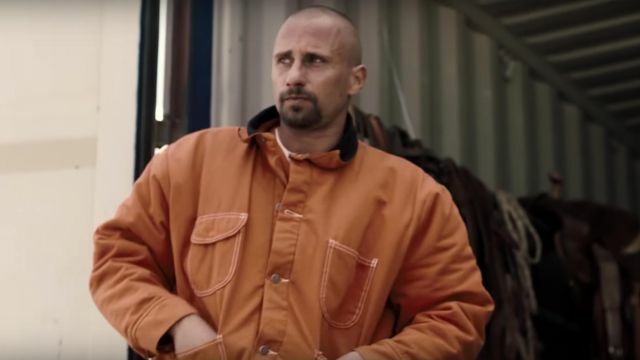 It is far more common for a protagonist to begin a film recently released from prison, attempting to adjust to the lifestyle, or wind up incarcerated as part of the ending. The actual rehabilitation process is rarely depicted. When it is, it’s usually to inform the audience that the program exists rather than having it weigh down the important part of the plot. In Laure de Clermont-Tonnerre’s directorial debut, she explores what a warden might do with someone who can’t connect with people. Understandably, Roman is quite hesitant about the idea at first. He is shown in his interactions with his daughter, Martha, that his anger issues have not been quelled in the twelve years since he started his sentence. Nonetheless, Roman eventually warms up to the idea – particularly when he befriends a fellow inmate named Henry, who is regarded as the best horse trainer. One of the interesting running themes of this film is that it’s difficult to say which party is being trained. On the surface, it’s easy to say that Roman is training the horse so he may find a willing owner, yet the truth is more complicated. Though he tries giving the horse a chance, his first attempts at training him end very poorly. At his worst, he swears at the horse before punching him several times. This results in both of them being restrained. When this happens, they are notably given close-up shots from the same angle. The narrative casts these two characters in an interesting light as a result. The titular mustang was one of many roaming the Western United States. They were captured en masse as a way of combatting overpopulation. Because the mustang didn’t grow up domesticated, whether or not its wild streak can be broken remains to be seen. Similarly, Roman, is a man ruled by his impulses and vices. He is fairly affable, but when something or someone sets him off, he turns into a maelstrom of violence. Through interacting with each other, they learn to rise above their natures and become something more. You know he has truly become serious when he finally gives the horse a name: Marcus. What I particularly admire about this film is that it’s not afraid to show the ugly side of prison life. The program suffers a major blow when Dan, Roman’s own cellmate, stabs Henry to death in the yard. It’s quick, brutal, and an utter waste of human life. The truly chilling thing is that it isn’t at all made clear why Dan decided to murder Henry. Just like in real life, these prison murders can occur at any time with little provocation. Even when Roman attempts to strangle Dan in his own cell, there is no catharsis to be found. I also have to praise the ending of the film for not going in too obvious in a direction. This is not a film in which things work out well for everyone, though it’s not without a ray of hope. Despite pleading with Martha to attend the auction, she does not appear. Despite his attempts to become a better person, it’s easy to see where she is coming from. After Roman’s crime, Martha had no choice but to take care of her mother. Given that she has faced a lasting reminder of her father’s evil every day for the past twelve years, she is in no hurry to forgive him. It’s easy for the audience to want her to give him a second chance, but she didn’t witness his character transformation. To her, he is the same violent man who took her mother away from her – the only difference is that he rides horses now. It is through her absence that a domino effect occurs. He gets distracted when he doesn’t see Martha in the audience. This causes Marcus to become startled by an overhead helicopter. As the helicopter reminded the horse of when he was first captured, he bucks Roman off his back and nearly tramples him. It is here that Roman realizes he has no life to return to outside of prison. However, in an entirely selfless act, he takes advantage of the prison’s weakened fences and frees the horse, preventing him from being euthanized. While it may seem a little convoluted how Myles informs Roman that the fence was damaged in a recent storm, it makes a lot of sense if you believe he subtly encouraged him to free Marcus. Touchingly, Roman spots the horse standing by the prison gates a few days later. The Mustang is a solid directorial debut that deserves to be watched. Director Laure de Clermont-Tonnerre and her accompanying writers Mona Fastvold and Brock Norman Brock knew how to create a deeply flawed character the audience can still empathize with. What I particularly like about his arc is that it’s transformative, but not disingenuous. He doesn’t magically become a good person after interacting with a horse for five weeks, but he is better off for it. Indeed, this film saw inspiration from a real rehabilitation program in Carson City, Nevada. The studies conducted after the fact show that these inmates are significantly less likely to reoffend. The rehabilitation of a criminal is an important subject that needs to be touched upon as often as possible. Even if certain sins cannot be erased, it is important to recognize when a terrible person wants a second chance – a theme this film demonstrates all too well. Prison films often resort to the same narrative of crime and redemption, with few that truly explores the in between. It’s interesting to see a different focus on the rehabilitation aspect. Nice review and recommendation, will be checking it out. It certainly made for an interesting change of pace. It’s a bit of a shame it’s not getting more buzz because it’s pretty good and worth checking out.